Siam City Cement (Lanka) Ltd., Sri Lanka’s foremost cement manufacturer of INSEE Sanstha Cement, has announced the appointment of Rizmy Rishard as an Independent Director, to its Board, effective from July 2018. He brings with him extensive experience in business transformation, having played a local and global role in multinational and local conglomerates during his career spanning 25 years. Rizmy is a Chartered Management Accountant and a Chartered Marketer with a strong affiliation to Human Resource Management. He received his executive education from the University of St. Gallen, Switzerland. He has broad industry and service sector experience backed by multi-disciplinary capabilities in finance, marketing, manufacturing, supply chain, human resources and information technology. His core field of expertise includes end to end business process optimisation, business transformation, business strategy formulation and mergers and acquisition. He has special interest in value stream lean management and analytical business intelligence together with artificial intelligence. 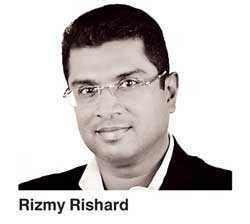 Rizmy has considerable experience in the cement industry having held positions at Holcim Lanka as Vice President and at Ambuja Cement as its CEO. Currently he is a corporate consultant and business transformation specialist providing an array of business support to medium-large scale companies both locally and overseas.